Security experts identified nearly 500,000 Ubiquit devices that may be affected by a vulnerability that has already been exploited in the wild. Security experts are warning Ubiquit users of a vulnerability that has already been exploited in the wild. Last week, the researcher Jim Troutman, consultant and director of the Northern New England Neutral Internet Exchange (NNENIX), revealed that threat actors had been targeting Ubiquiti installs exposed online. Remote attackers were targeting the networking devices exposed via a discovery service accessible on UDP port 10001. According to the expert, the devices are affected by a DoS flaw that attackers were attempting to trigger. The vulnerability is not a novelty in the security and Ubiquiti communities, in June the issue was discussed in a thread on the Ubiquiti forums where users were warning of a possible exploit used in the wild. Now security experts at Rapid7 revealed that they were monitoring suspicious traffic destined for port 10001 for at least one year. Ubiquiti is aware of the issue and is currently working on a firmware update that will address it anyway it is trying to downplay it. “There has been some discussion lately about a bug in airOS which can result in management access to airOS devices becoming inoperable until these devices are rebooted. This issue appears to be caused by external access to airOS devices using port 10001. As a temporary workaround for this issue while it is being investigated and resolved by the development team, network operators can block port 10001 at the network perimeter.” reads the advisory published by Ubiquit. Waiting for a fix, Ubiquiti recommends blocking UDP port 10001, but this solution could have a disruptive effect on some services. Scanning the Internet for vulnerable devices using the Rapid7’s Sonar project, experts found roughly 490,000 devices exposed online. 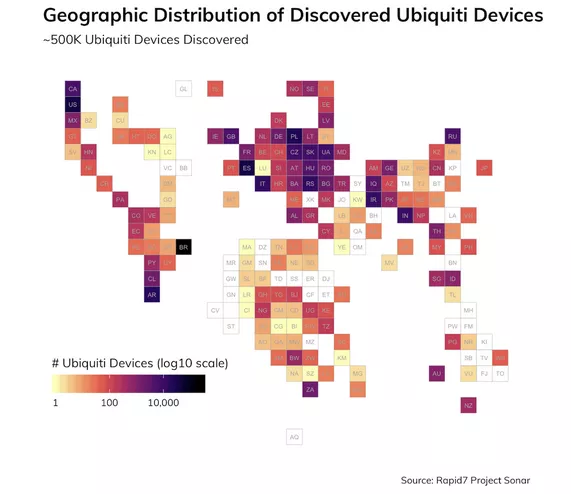 Most of the vulnerable Ubiquiti devices are located in Brazil, followed by the United States, and Spain. The analysis of the names of the device revealed that in 17,000 cases they contain the string “HACKED-ROUTER-HELP-SOS,” a circumstance that suggests that they have already been hacked by exploiting other vulnerabilities. Rapid7 reported its findings to US-CERT, CERT Brazil, and of course Ubiquiti.